Well you are in luck, cause we are about to explain. 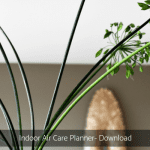 Indoor Mould: 3 Ways to Get Rid of It! Clearing your mouldy rooms doesn’t have to be a game of trial and error. Follow this step-by-step guide to help you through testing for mould in your home. This is the most common sign of all the mouldy indoor environments and yet the least observed because they start because of lack of understanding and recognition. Sometimes you’ll experience these symptoms on and off in your home which can cause your entire family dis-ease. You may also not see this mould growing anywhere in the building. It’s really easy to brush off symptoms as nothing of concern and when you leave the mouldy building, you feel better. The hopeless thing about allergic symptoms to mould is that it’s easy to totally miss the diagnosis for some time if ever. It may only show up in sneezing and can’t stop coughing, headaches and tiredness that are similar to having the flu in which case a little medication and rest will do the trick. Mould by stealth is invisible from most surfaces of materials in spots that don’t get a lot of light, though you can smell it. It’s there! Mould you’ll find in stagnant, dark spaces and sometimes can be mistaken for poor cleaning practices or damp materials that somehow never got dried properly. This mould is difficult to get rid of and won’t be killed off by any normal dose of sanitizer (such as bleach) or a washing agent. You need to kill it by looking for the trigger or else you’ll be battling with it for what seems forever. Got mouldy smells? 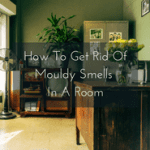 Here’s a very simple 10 step guide that will walk you through how to remove stubborn mouldy smells from your home. If you ever had mouldy smells and thought that was tough, think again. 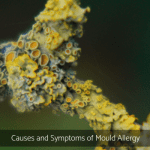 Moulds appear and spread, although the not so good thing is it’s very common. What makes visible mould so hard to get rid of is the dispersion to more materials and rooms, it’s potential to be a larger colony than first thought. This mould looks like little dark, black spots, grey colonies or colourful growths on your walls, windows, ceilings, flooring and your furniture. Gross! The part that you can see is the mycelium that is growing out in all directions forming a circular pattern across the surface, and hyphae growing above and below surfaces like the plaster in your walls. Just like visible mould, it can appear even if you are taking care of your home normally and all your ventilation levels are correct. To kill it you will need fermented white vinegar and lots of elbow grease and find where it started. 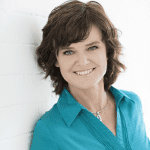 Toxic mould is perhaps the hardest mould to get rid of. Follow this step-by-step tutorial to help get rid of toxic mould in your home fast. Why Do I Have Mould? Where there’s water, there’s mould. Which is why buildings need to be ventilated with air to ensure nasty bacteria and other growths don’t get into our homes and offices. The main reason why mould grows in your home is because building and soft furnishing materials haven’t been dried properly after getting damp, or hasn’t been exposed to enough light. Also, when your building is lacking ventilation, air circulation and the moisture is stagnant, you’re gonna get mould. That’s why it’s important to keep the indoor air moving by opening windows and doors and moving furniture. It’s hard for mould to grow when the air is drying. These are all great spots for mould to feed and multiply. So now that we have a general understanding of what indoor mould is and why it forms, we must destroy it! These are 3 different stages of mould, at differing amounts. The more mould in your home, the more spread out the infestation will be. I’ve seen homes almost consumed by mould infestation. Gross! If you suspect you have hypersensitive symptoms you need to thoroughly check your building in order to kill mould. Finding the trigger point is important. So, if you have a leaking roof or gutter spilling into the eaves and ceiling cavity you need to remediate it by fixing them. If you have water pooling under the building or creeping up along the walls, you need to remediate it by draining water away from the footings. 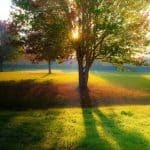 And if you have tall, shady trees and gardens butting up against buildings you need to remediate it by creating more light. If you have surface abnormalities like peeling, bubbling or cracking of the paint or wallpaper you need to remediate it by drying moisture that has gotten into them. If you have dark, closed up cupboards you will need to remediate it. So, you will need to open cupboard doors, clean ALL contents, clean ALL surfaces, ventilate, ventilate, ventilate. Simply dry and air it out! If you have wet and forgotten damp furnishings from flooding and poor drying practices you need to remediate it by throwing them out, and so on. If you have a mouldy surface area the size of a standard door size or less, you need to remediate your affected area in order to kill mould. So, it’s always best to book chat time with a Building Biologist with their experience and knowledge of spots and triggers where mould often hides. If you have a fuzzy veil of mould on larger surface areas that resemble the stuff Hollywood horror movies are made of, you will need to bring a Building Biologist on site. 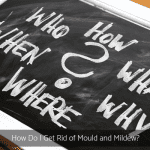 So, if you have an expert to discuss, assess and test mould, they can determine the size and extent of the mould colony before professional remediators can begin to remove it. It’s a good idea to book in your Building Biologist to save you money and stop mould immediately. A Building Biologist has experience at collecting and analysing mould samples leading to the most accurate results. Remember, open doors and windows and ventilate, ventilate, ventilate! Note: If you live on ground floor apartment block, you should check neighbouring apartments on the same floor and above yours. This will assist in determining if there is more to your mould than you first suspected in your place. Also NEVER CLEAN WITH BLEACH. We cannot stress this enough. Bleach is often regarded as the answer for removing and halting mould growth, bleach actually contributes negatively to certain mould problems. Chlorine bleach creates toxic chloramine vapours and is classified as hazardous. And remember, always open windows when cleaning mould, bleach generates a by-product called dioxin, which is linked to cancer. Fermented White Vinegar is a natural acid which kills bacteria and germs and nearly all mould, most probably by denaturing (chemically changing) the proteins and fats that make-up these nasties. It’s totally non-toxic and safe of course, you can drink it you know! It’s also biodegradable and environmentally cool. After all the mould is dead, it’s your job to wipe them OFF your walls, ceilings and furniture. This method is more work and can be time-consuming, but gets rid of mould fast, if done correctly. I always recommend a pure fermented white vinegar like Cornwell’s. It is Australian made and very effective for keeping mould from growing in your home. Pour fermented white vinegar into a bucket. 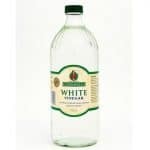 I prefer to use authentic fermented Cornwell’s White Vinegar, not that imitation vinegar. You can use a spray bottle. This will be more suitable for small direct spots. All this does is apply vinegar solution by spraying to the targeted spot rather than overall larger areas because of the intermittent spray dispersion coverage. Add the recommended amount of water to the vinegar. 1 part water to 4 parts vinegar. 20% water to 80% vinegar. Mix the solution for about 30 to 60 seconds to get the water fully mixed in, and stand bucket next to affected area. Soak thin kitchen or chux wipes in a bucket. How many depends on the size of the area to be cleaned. Before you turn your attention to the cleaning, make sure you have your windows and doors open to help with drying and ventilation. If you are worried about vinegar irritating your skin, you can wear rubber gloves. Vinegar is totally safe though. Your wipes may not be strong enough to clean the mouldy wall that effectively, so water will get dirty. You don’t want this. Make fresh solution as many times as required. Also, make sure you hook up a disposable bag to direct the wipes when finished. Add wipes to the affected area after lightly ringing them out, flatten them so as they’re covering the area, even overlapping. Since you’re applying wipes in a blanket manner, beyond the visible mould, it’s best to leave on as they dry naturally. SLOWLY scrub the affected surface to remove deeper mould using a scrubbing brush. Rinse and wipe the surface with refreshed solution. You may have to do this several times depending on how much sub surface mould you need to clean (I told you it would be hard work). Dry, remove and dispose of wipes in a disposable bag. 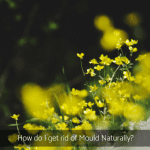 Dispose of mould contaminated solution in the garden. To remove mould from clothes and linen, soak them in a half vinegar and half water solution overnight. Then rinse the vinegar out of the clothes, wash them in the washing machine with normal laundry detergent. Regularly cleaning your home with vinegar helps to prevent mould growing. You can mop your floor with vinegar each week. Regularly rinsing your bathroom walls with vinegar is also good. Vinegar is also effective for cleaning the kitchen. If you have a spray bottle of vinegar in the bathroom you can prevent mould by using it every week after a shower. Spray the shower curtain, walls, tiles, basin and bathtub after you finish showering. With just a little bit of elbow grease and this cheap acid, you can have your mouldy surfaces cleaned in one day if you’re willing to do the work. When you are done cleaning the affected surfaces and everything looks good, I would suggest double checking your room to make sure ALL the mould has either been removed or destroyed. I’d recommend vinegar solution weekly as a preventive and should be used throughout the year. The reason is, once you start cleaning with vinegar that can kill mould, the vinegar solution starts cleaning up bacteria and germs too. You can mop your floor with vinegar each week, spray vinegar on your bathroom and kitchen walls too. All of these methods work. In fact, you might visit three different websites or talk to three different people and they will usually just promote one way of doing it. This is why getting your mould care information from different places can cause confusion. My recommendation is using which method is appropriate for the situation. Method 1, it’s effective, it’s progressive, and it PREVENTS all the mould. I use Method 2 when I’m in a pinch, like when guests pop in THIS WEEKEND, oh no! and method 3 is for those who are reading this for the first time, suffering from mould in their home. 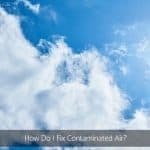 As a Building Biologist, I have acquired knowledge of adverse health effects and recommend effective strategies to reduce occupants’ exposure by eliminating and controlling as many sources of pollutants in order to create healthy indoor living environments that are as exposure-free and natural as practically possible. Thanks for this, I’ll try this! You are welcome! let us know how you go so we can help others who may be in similar situation.